Very recently I was reading a book on world rail travel called the Illustrated Book of Steam and Rail by Colin Garratt. It lists one hundred great railway routes around the World. Two railway routes from Pakistan are also included in this top 100 list. One of them is the historic Khyber Pass Railway and the other is the Trans-Baluchistan Quetta-Zahidan Railway. 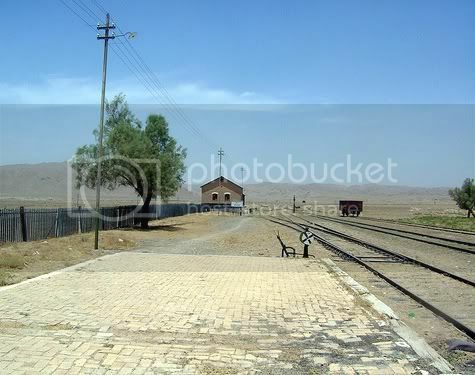 The photo above is from Tozgi Railway Station located on Spezand-Taftan route. The scenery here seems to come right out of the moview Lawrence of Arabia. British built quite a few strategic railway lines in the land which now comprises Pakistan. These lines were built for purely Military purposes. 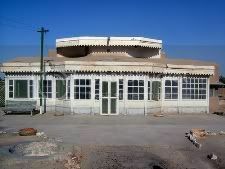 The Trans Baluchistan, Quetta-Zahidan railway was also constructed as part of a strategic military route. During World War I, advance agents of Turko-German power had penetrated deep in Iran and Afghanistan to prepare ground for an invasion into India. To counter these threats, British built the strategic rail link between India and Persia (now Iran). 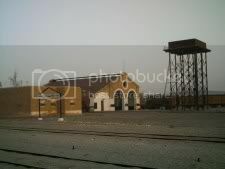 The Photo above is Kishingi Railway Station which is located 138 km west of Quetta. Before World War I, 158 km of railway link already existed between Quetta and Nushki. This branch line was opened on November 15, 1905. Before railways came here, Camels used to be the only means of transportation west of Nushki. In 1915-16, some disease killed camels in excess of 30000. It is said that men could find their way across 500 km of desert by keeping an eye on dead camel carcases which were spread and strewn so closely to eachother. 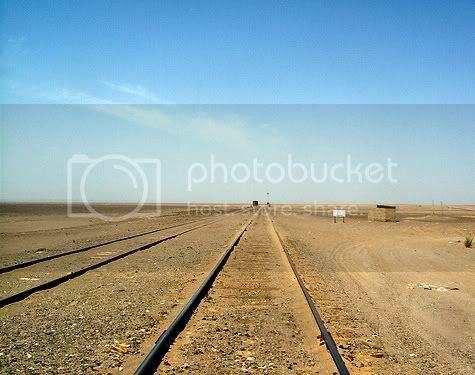 The railway construction west of Nushki towards Iran was named Nushki Extension Railway. 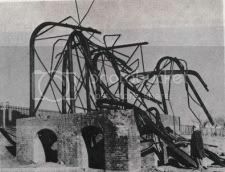 Work started on it in September 1916 under the charge of Mr. P.C. Young as Engineer-in-Chief and the railway line reached Iranian town of Duzdap (now Zahidan) on October 1, 1922. The cost of construction was Rupees 40 million. Government of India bore the expenses on Indian side of construction and British Government paid for the construction in Persia (Iran). By the time Railway line reached Duzdap, British had already demobilized their forces in East Persia. This demobilization happened in March 1921 and it took away the importance of the newly built railway. So much so that in 1931, 221 km section between Nok-Kundi and Duzdap (Zahidan) was closed down and track removed to be used elsewhere. World War II however, renewed interest in Quetta-Zahidan link. British forces wanted to aid Russian forces against Germany in Persia (Iran). The aid never materialized but Quetta-Zahidan link got rehabilitated. 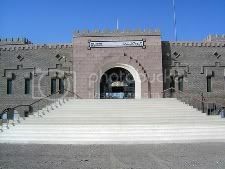 It was reopened at 6 p.m on 20 April 1940 in Zahidan. Eighty Five years later, the Quetta-Zahidan section is still operational, though barely. It is considered among the great Railways of the world because of its desert scenery which is unique for this part of Pakistan. A place where time stands still. This can also be judged from the fact there are only 14 Railway Stations in the last 553 km section of the track. The total length of track from Quetta to Zahidan is 732 km with the last 100 km section being inside Iran. At present, a fortnightly train called Passenger 403 Up/ 404 Down runs on this section. It leaves Quetta on every other Saturday at 8:00 a.m. and comes back on Tuesday afternoons. At present it is a mixed train with only one economy coach available for the passengers. In 1948 Pakistan Railway (then called North Western Railway) was running 4 passenger trains on this route. Three trains ran between Quetta and Ahmedwal where as one ran all the way up to and back from Zahidan. These trains not only carried passengers coached but also had a ‘buffet car’ attached to them. This buffet car was actually a 4-wheel covered wagon which dispensed hot curry, chapatis etc. These buffet cars were included as a safeguard against starvation in the desert incase of an untoward breakdown. The ‘buffet cars’ only ran between Quetta and Nok-kundi (511 km). 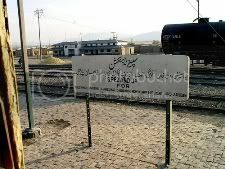 Once the journey starts from Quetta, first 24 kilometers are traveled on Main Line up to the junction of Spezand. From Spezand the track branches off to the west. As shown in the photo below, 48 km from Quetta is a place called Wali Khan. Its older name was Mastung Road. 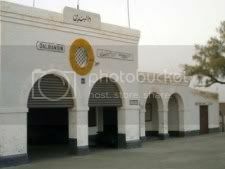 There is a Railway station in this town which saw major damage during the famous 1935 earthquake of Quetta and surrounding areas. The photo to the left above is probably the rebuild of the same water tank which looks so crumpled after the 1935 earthquake in the photo to the right above. The famous Pakistan-Iran RCD highway (now called N50) also runs parallel to the rail track. Passenger 403 Up runs at its slow pace and reaches the first major town called Nushki, 158 km from Quetta in almost 7 long hours. From Quetta to Nushki, rail track and N50 Highway run parallel to each other as well as criss cross eachother at 8 places. 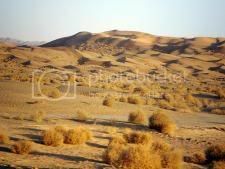 West of Ahmedwal starts the desert landscape for which this section of track is world famous. Dalbandin is located 164 km west of Ahmedwal. There is no vegetation here and only one railway station called Padag Road in between. Passenger 403 Up reaches Dalbandin around quarter past nine in the evening and has a 45 minute stop there. 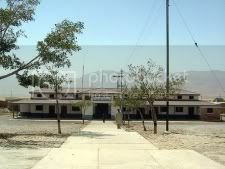 (ii) The residence of Railway Staff (AEN) at Dalbandin. Note the British Architecture of the building. 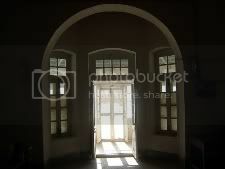 (iii) Arched architecture of Raj days inside the residence of Railway staff (AEN) at Dalbandin. 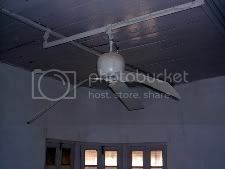 (iV) A Vintage Fan from British Raj days, inside the Railway Staff (AEN) Residence at Dalbandin. 58 km west of Dalbandin is the town of Yakmach. Yakmach will probably be the next Railway Junction for the future 550 km extension of the railways to the now functional Gawadar Port. The new Railway section will start from Yakmach, and passing through Hoshab, Panjgur and Turbat will connect to Gawadar. 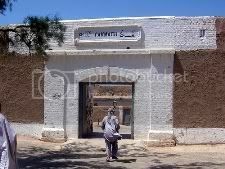 By the way there is a famous local legend that Queen Noor Jahan, wife of Emperor Jehangir of India was born at Yakmach. It is said that a caravan coming from Persia to Dehli saw one date tree and decided to stay a day or two here. The word Yak means One and Mach means a date palm tree. Hence the name of the place Yakmach. On the very same day the wife of caravan leader gave birth to a baby girl who later grew up to become famous as Noor Jehan, the Queen of India. If all these legends are correct then it Looks like Noor Jehan was quite a traveller herself. At ATP we also discussed another legend attributed to Noor Jehan, in the Land of Kunhar, which is almost 1500 km north-east of Yakmach. Back on Quetta-Zahidan track, we will now cover the next 110 km section between Yakmach and the next town called Nok-Kundi. The track passes through long stretches of desert covered with sharp black stones and rough stingy desert sand. For eight months of the year, temperature goes well above 100F during day time and what locals call the 120-day wind, whips the sand into tight little mini tornadoes that lacerate the skin. The desert is covered with sulphur, dust and water. Water, where available tastes like a concentrated mixture of common and epsom salts. When there is any rain at all, the whole year’s fall may occur within an hour like the one that fell in July of 2007. The river beds, bone dry for 330 days out of 365, then hurl the water, laced with quantities of stone, at the exposed railway. To overcome this disconcerting event, the engineers built Irish bridges or ‘dips’ and the drivers of the steam-hauled trains crossing them were expected to use their discretion as to whether they could pass through without water getting into their fireboxes and putting the fire out. As if these hurdles were not enough, there are marching sand hills which in local language are called do-reg (Two Sands). 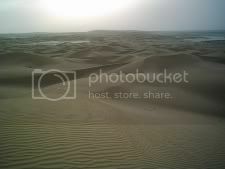 These are the crescent-shaped sand-hills formed by the wind and constantly on the move. 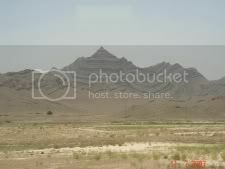 These sand hills are mostly located in the 120 km section between Nok-Kundi and Koh-i-Taftan. Again the railway line is the target and, from time to time, diversionary track has to be laid to take the railway round the back of the do-reg to avoid several thousand tonnes of sand. The sand-hills move in parallel lines for many miles across the desert. Their speed is 500-600m (1600-1900ft) per year, so the duplicated tracks are left in position and trains use whichever one happens to be clear of sand. Sometimes the marching sand-hills cover the track, and then all the male passengers from the stranded train spend hours re-laying the track. Spare lengths of rails, shoes and sleepers lie alongside in readiness for just an emergency. These then, are just some of the vicissitudes of a trans-Baluchistan journey. 122 km west of Nok Kundi is Pakistan’s last town and the border check post of Koh-i-Taftan. Up until few years ago the passenger 403 Up/ 404 Down was called Taftan Express which was named after this city. 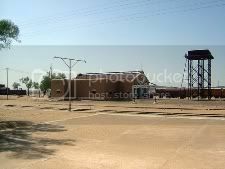 As you can see in the photo Taftan Railway Station buillding is very new compared to other stations on this route. The new building was built in mid 1990s. 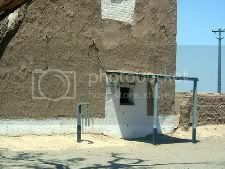 Before that, Taftan station used to operate from a hut made out of raillway sleepers. Foundation stone of the current station was laid by the late GM Railways Zafarullah Qureshi. The new buliding also has a underground structure including a few inoperative shops, an immigration office (unoccupied by the immigration staff), a running room , etc. Electricity to Taftan is provided through Iranian electricity grid. Koh-i-Taftan is also the only live (though dormant) volcano in Pakistan and it makes the rail track unique as it passes within sight of it. After Koh-i-Taftan, the International boundary between Pakistan and Iran is somewhere in between the next 5 km. 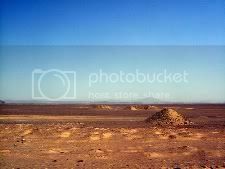 The Passenger 403 Up crosses into Iran and the first station on Iranian side is called Mirjawa which is at a distance of 5 km from Koh-i-Taftan. Passports are checked here and new tickets are issued for the last 96 km journey to Zahidan, which is reached, if there are no delays such as those mentioned above- some 30 hours after departure from Quetta. At Zahidan, Passenger 403 Up/ 404 Down has an overnight stay and leaves back for Quetta on monday morning. I am giving the map of the Quetta-Zahidan Railway as well as the timetable of Passenger 403 Up/ 404 Down below which will give us an idea of distances and timing between the cities on this route. August 1886: Quetta connected by Railway through Bolan Pass. Includes Quetta-Spezand (24km) portion of Quetta-zahidan route. 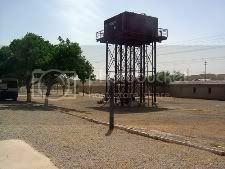 November 15, 1905: 138 km long Spezand-Nushki section opened for Rail traffic. August 1916: Governmet decided to built Nushki Extension Railway and a survey was conducted. October 1, 1920: 306.97 km long Dalbandin to Mirjawa section opened. March 1921: British immobilizes their East Persia(Iran) military presence. October 1, 1922: 84.4 km long Mirjawa to Duzdap (now Zahidan) section opened. 1923: Railways completely took over the trade business from camel-transport between India and Persia. July 10, 1931: Nok-Kundi to Zahidan section is closed down. 6 p.m., April 10, 1942: Nok-kundi-Zahidan section is reopened. 1948: Frequency of trains on this route reached an all time high of 3 weekly trains between Quetta-Ahmedwal and 1 weekly between Quetta-Zahidan. 1967:Mr. N.A. Qureshi, Chairman of West Pakistan Railway board handed over the maintenance of track and manning of stations in Iranian territories to Iran. 2007: Frequency of trains reduced to 1 fortnightly between Quetta-Zahidan. I have not travelled on this route myself yet. The only portion I’ve travelled is Quetta-Spezand (24 km) by rail and Quetta-Mastung (48 km) by road. The information for this article comes from the reference material cited below. Hopefully one day I’ll travel this route in detail and I also hope PR increases the frequency and quality of rail service here. ATP’s Other Posts related to Railways and Tramways in Pakistan.